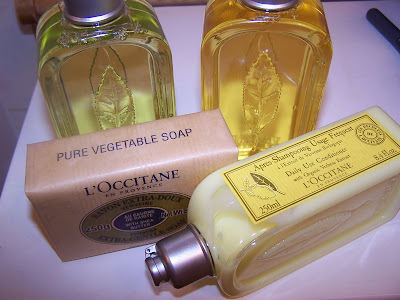 One brand that probably doesn’t get nearly enough love from the Muse on her blog would be L’occitane. Weirdly enough I don’t think I’ve ever done a single blog about this amazing brand! 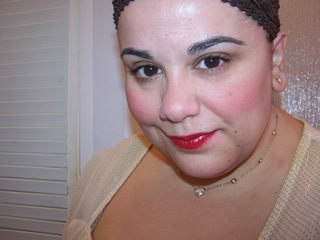 I’m a big lover of L’occitane and it justly deserves it’s own special entry! Sadly, it’s not all about L’occitane as this blog was inspired by Lush’s new hair gel King of Mods. I just wrote a rather delightful review about King of Mods (You can read my review of King of Mods by clicking here) and was hinting at some products that would go well with it and I can think of nothing else that would be go fantastically with it then none other then L’occitane’s Lemon Verbena collection! I have the biggest love affair with lemons. I love the wicked combination of the scent of lemons. It’s a tart sweetness that’s the perfect contradiction. It’s fruity and it’s slightly sweet but it has a wicked tartness that’s eye opening! And what better way to wake up in the morning than with some yummie Lemon scented products?! Nothing captures the essense of lemons like L’occitane’s Lemon Verbena collection! Four of my absolutely must have Verbena items are the Shea Butter Extra Gentle Soap, The Verbena Shampoo and Conditioner, and the Verbena Shower Gel! If you happen to pick up a jar of King of Mods I can tell you that washing your hair with L’occitane’s Verbea Shampoo and Conditioner and finishing with King of Mods will leave your hair delightfully scented in a beautiful array of fresh smelling citrus that will last all day long! 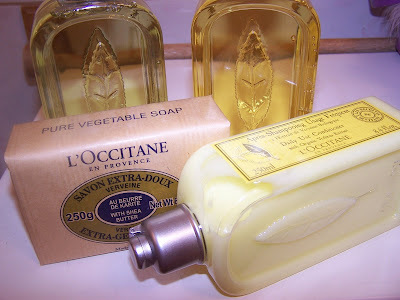 Sadly, L’occitane’s products are not cheap by any means but they are well worth the price tag in my humblest opinion! The Shea Extra Gentle Soap is delicately scented with Verbena and is extra moisturizing. 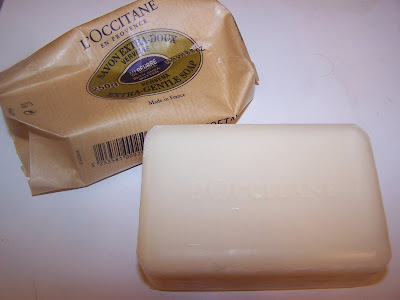 The only quirk I have with L’occitane’s soaps are they are so monstrously big and over sized! These are 8.8oz which is about triple the size of your normal soap. It’s good because it’s a large chunk of soap for $10 bucks but it’s quite bulky to use when in the shower! It most definately gets my seal of approval for the smell and skin benefits but the size is definately something that turns me off! Lucky You! I just started a new bar this morning! Here’s a chunk all yummie and awaiting my use! Verbena Shower Gel is probably one of my favorite in the line! It’s a bit pricy at $20 for 8.4oz but I must say it’s one of my guilty pleasures that I just adore. Nothing gets me awake in the morning like a burst of yummy tart lemons and this shower gel most definately tantalizes with the smell of lemons! It suds very nicely and the smell actually does linger sometime on the skin which is always a plus! It doesn’t dry my skin out which I do have a problem with when using shower gels so it gets an A+ for that! Last but not least would be the perfect companion to King of Mods so as promised I bring you Verbena Shampoo and Conditioner which are equally as gorgeous and lemony smelling as the soap and shower gel! Perfect for layering all together to create a beautiful fresh scent! Both are very light so you don’t have to worry about build up! A few items I use and haven’t mentioned would be the Verbena Eau de Toilette and Verbena Lotion. The lotion is lovely and very moisturizing and it layers well after using the Shower Gel! As for the Eau de Toilette it’s sadly something that fails to linger. The throw is a bit weak and you really have to spray yourself down for it to have any lasting quality. It’s quite disappointing as the fresh smell of lemons is beautiful in this spray but it just doesn’t last long enough to justify it’s cost. I wish they’d consider doing a strong Eau de Parfum! Overall, the collection is beautiful and is very Muse approved and of course perfect for layering with the new love of my life King of Mods however I must say that if L’occitane can capture the essence and freshness as well as Lush they’d most definately have me throwing a ton more money at them but until that day I definately approve of the Verbena Collection they do have available! Hi Musey! I LOVE the Verbena collection, the only citrusy thing that doesn’t turn to dishwashing liquid-smell on me! Yum! Very RQ-approved too! Today it’s Lucia here in Sweden, it’s like a yearly celebration of light with songs and loads of candlelights. I guess it looks very strange to foreigners! Awww it looks so lovely!!!! Enjoy! I might take you up on that offer to come visit and stay with you hehe 😉 You can show me the sights! Enjoy! I know how much you’re digging the holiday so do enjoy! 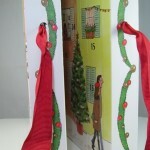 It’s delightful to see how much of the Christmas spirit you have!